After finishing my Invisalign treatment I want to be sure my mouth is healthy and that my smile is beautiful. After all I went through a year and a half of pain and spent a lot of money to finally get my beautiful smile and I want to keep it! The facts are in and a product like Colgate Total® Advanced Pro-Shield™ Mouthwash will keep my mouth healthy. By adding Colgate Total® Advanced Pro-Shield™ Mouthwash to my daily routine I can easily protect my mouth for 12 hours from germs. Colgate Total® Advanced Pro-Shield™ Mouthwash kills 99% of germs on contact and keeps working for 12 hours—even after eating and drinking. Use it together with Colgate Total® toothpaste and toothbrush to help improve the health of your mouth. You can easily find this product at your local Dollar General® where you will also find other great products from the Colgate Total® Advanced Pro-Shield™ line! It's the best place to get mouth wash and other health and beauty needs! I took the online quiz and have learned over the past few months since getting my permanent retainers how important it is to make sure my mouth is ultra clean. A product like Colgate Total® is a healthy choice for me and can be one for you as well. Just ask yourself what are you doing right now and what can be changed? 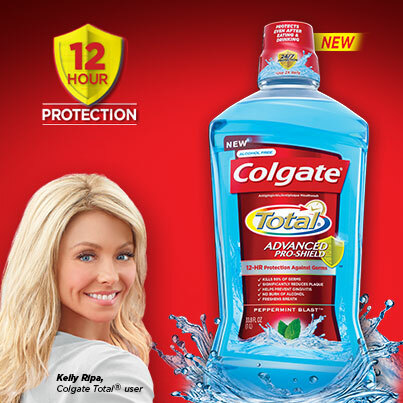 Be sure to visit Colgate Total and take the online quiz too! You just may never know what you may learn and you can find out how Colgate Total® products will be most helpful to you and where to locate them in your area. I’d like to try this mouthwash and see how it works for me. Listerine just burns too badly.